Show your love this Valentine's Day with dessert straight from the heart. 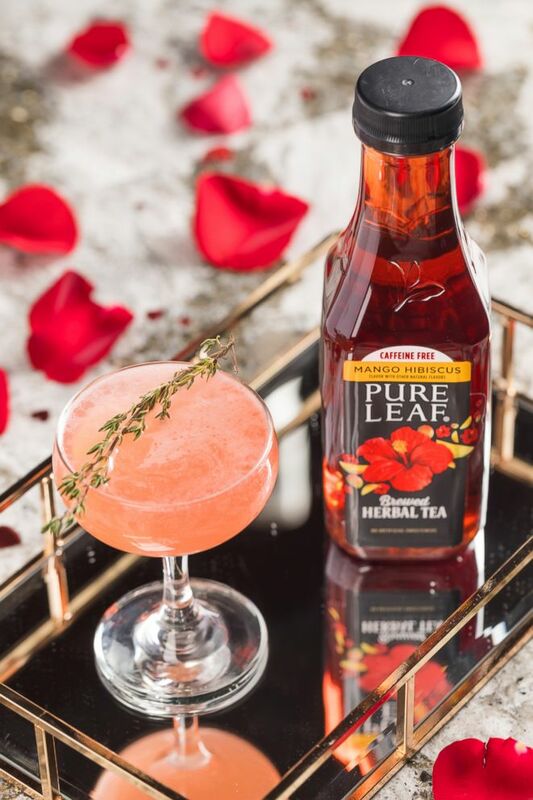 Chef Marcus Samuelsson, a paid spokesperson for sponsor Pure Leaf, visited "Good Morning America," to share his recipe for a seasonal "Valenthyme" mocktail made with mango Pure Leaf hibiscus herbal tea, lemon and thyme. 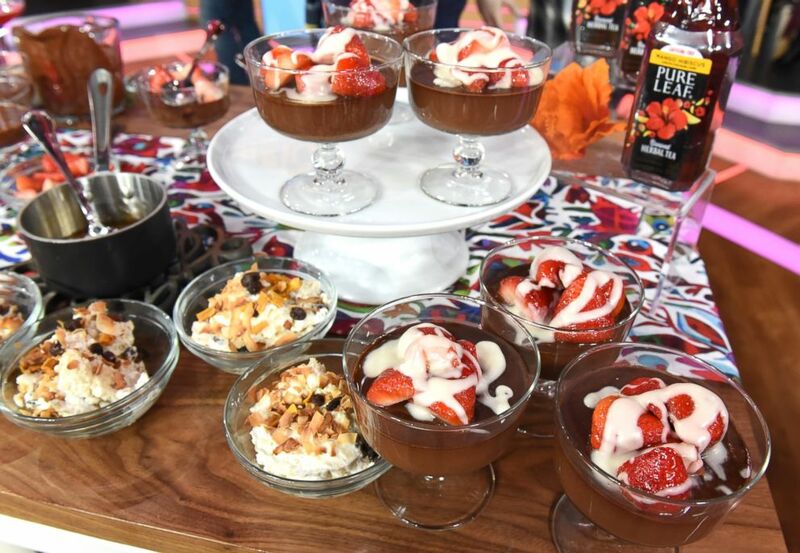 Samuelsson also recommended making a unique dessert: a chocolate pannacotta with strawberry compote and cream cheese glaze, or a coconut rice pudding with fried banana to impress. 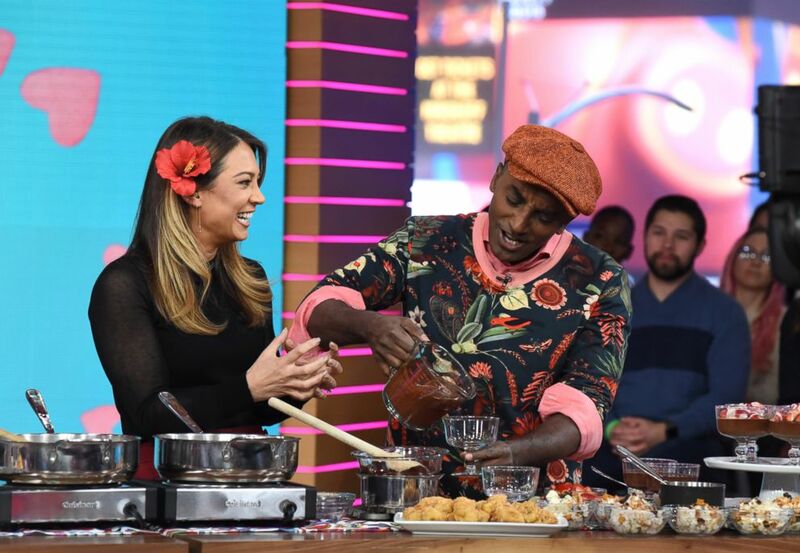 Get the full recipes for his mocktail and dessert ideas below! Shake all ingredients over ice and serve in a coupe. Garnish with thyme sprig! Lightly oil 4 individual ramekins or other molds, 200ml capacity. Chop the chocolate into small pieces and melt slowly, without stirring, in a heatproof bowl set over a pan of gently simmering water. Remove the bowl of melted chocolate from the heat and set aside to cool slightly. Soak the gelatin leaves in cold water for about 5 minutes to soften. In the meantime, put the milk, cream and sugar into a heavy based pan. Scrape the seeds from the vanilla pod and add these to the pan with the empty pod. Place over medium heat and bring to a gentle simmer, stirring once or twice to help dissolve the sugar. Remove from the heat and strain through a fine sieve onto the melted chocolate, stirring well to combine. If necessary, return the chocolate mixture to the pan and reheat gently - it needs to be very hot but not quite boiling. Take off the heat. Squeeze the gelatin to remove excess water and add to the cream, stirring to dissolve. Strain the mixture through a fine sieve, then pour into prepared molds. Allow to cool completely, then refrigerate for at least 2 hours before serving. In a pot, warm honey. Cut strawberries in half and toss in honey. Let macerate for 5-10 minutes. In a large bowl, whisk or beat all the cream cheese glaze ingredients together until smooth. Drizzle over pannacotta and top with strawberry compote. Place the rice in a fine mesh sieve and rinse under cold running water for 15 minutes to remove excess starch. Combine the milk, coconut milk, brown sugar, cardamom, ground ginger, cinnamon stick, fresh ginger, lemongrass, salt, and rice in a medium saucepan. With a sharp knife, slice the vanilla bean lengthwise, then use the back of the knife to scrape the seeds into the pan. Add the vanilla bean. Bring the mixture to a boil. Reduce the heat, cover, and simmer until rice is tender, about 20 minutes. Remove from heat and transfer the rice mixture to a bowl. Remove and discard the cinnamon stick and vanilla bean. Add the raisins, coconut, and mango and mix to combine. Set aside to cool. In the bowl of an electric mixer fitted with the whisk attachment, whip the cream until soft peaks form. 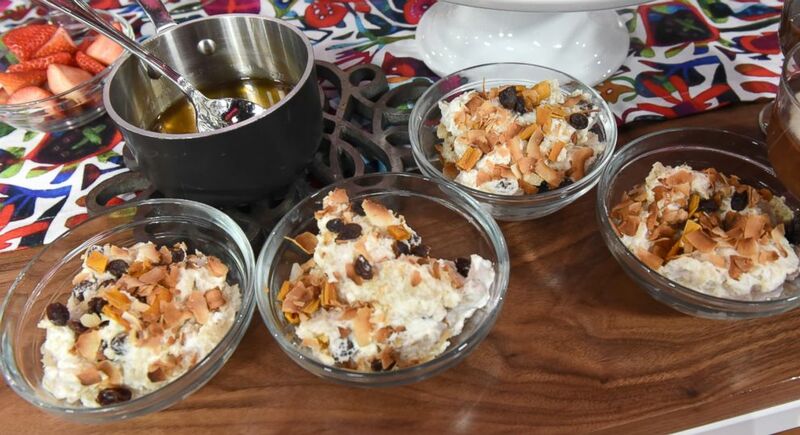 Fold the whipped ream into the rice pudding until creamy. Divide the pudding evenly among eight ramekins and garnish with the toasted coconut flakes. 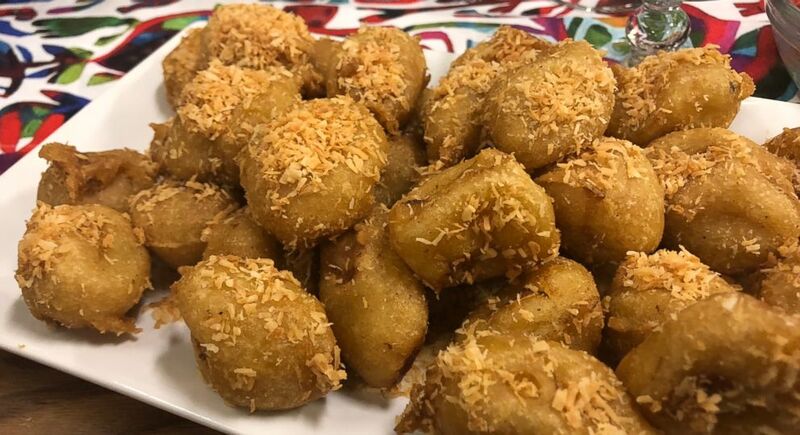 Serve with the fried bananas. In a medium bowl, combine the flour, sugar, salt, coconut milk, rum and baking soda. Slice the vanilla bean lengthwise with a sharp knife, using the back of the knife to scrape the seeds into the bowl. Discard pod. Let sit at room temperature for 30 minutes. Heat the oil in a deep pot to 350°F. While the oil is heating, peel the bananas and dip into the batter to coat. Add the bananas to the oil and fry until golden brown, about 3 minutes. Remove the bananas with a slotted spoon and drain on paper towels. Immediately sprinkle with coconut. Recipes by Marcus Samuelsson, "The New American Table" (HMH 2009).